Tiel is one of the oldest cities in the Netherlands. It was first mentioned in a document dating back to 855, where Tiel is referred to as "Dioli". In the second half of the 10th century, the city developed into a very important trade centre. Tiel was even given the right to mint its own coins, which at the time was a privilege that yielded a lot of advantages. Tiel produced an enormous amount of coins. Coins from Tiel were found as far away as Russia. The powerful German Hanseatic League of mercantile towns and cities on the big rivers was formed in the 13th century. Tiel also became a member of this league of Hanseatic towns and cities. After the industrial revolution in the 19th century, many new industrial production companies set up business in Tiel. During WWII, a number of historic buildings were unfortunately lost. Still, some prominent buildings and churches survived and are certainly worth a visit. Also, the original Medieval street pattern in Tiel is still entirely intact. 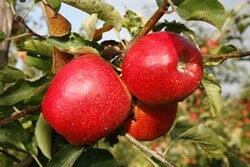 Tiel lies in the Betuwe, a region that surrounds Tiel and that is famous for its fruit production. 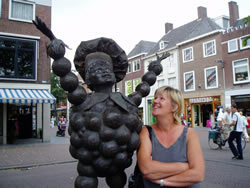 It is also referred to as the Dutch fruit garden, with Tiel as its capital. At the end of the 19th century, the fruit was processed into all sorts of products, such as jam and fruit juices. 'De Betuwe' in Tiel was a big jam factory. Due to competition from other European jam makers, the factory started an advertising campaign in 1930 to raise awareness for its own products. Flipje became De Betuwe's marketing icon and is well known throughout the Netherlands. Currently, Tiel is mainly a city of companies in the service provision, technology and transport sectors. Flipje, the marketing icon, is a fictitious character. He is made of the product he promotes, namely fruit. In the way that Bibendum, Michelin's marketing icon, is made up of car tyres, Flipje is made of berries and raspberries. Flipje represents health food. Over the years, many comic strips and books were made about Flipje. 'De Betuwe' jam factory no longer exists, but Flipje is still the mascot of the city of Tiel. Tiel's residents are proud of him, and there's even a museum in Tielwww.streekmuseumtiel.nl) dedicated to Flipje, where his entire history is on display. Tiel is located on Europe's busiest river, the Waal. This side river of the Rijn, offers the city many trade and transport possibilities. 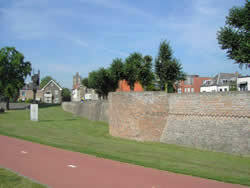 However, Tiel is also great for tourists as it lies in the heart of Holland's famous river landscape. At times, the water shows its dangerous side. In 1995, water levels in the river rose to such an extent that the city was in danger of being flooded. Everyone was evacuated. Military staff and emergency service providers worked hard to reinforce and raise the river banks. Ultimately, Dutch inventiveness and knowhow in hydraulic engineering beat the water. The city remained dry and its residents were able to return to their homes. Each year, Tiel hosts a fruit parade. 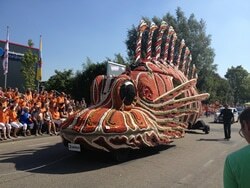 People from Tiel and the entire region decorate floats with fruit. On the third Saturday in September, a magnificent parade of beautifully adorned floats of fruity works of art makes its way through Tiel. It is an event that is unique to Tiel. In 2013, the fruit parade was included on the inventory of immaterial heritage in the Netherlands (/www.fruitcorso.nl). 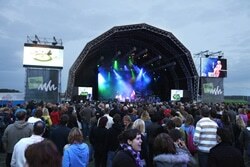 Another special event, held in the second week of September, is Appelpop. This is the biggest free music festival in the Netherlands, spread out over two days and hosting famous national and international artists (www.appelpop.nl).